It may have been grey and dull outside but my workshop was full of colour. I worked on a customer UFO that has been waiting 10 years to be quilted. It is really bright and I am sure that its new owner will be thrilled. I used my coffee breaks to micro-stipple part of the second Celtic Knot but it is still a long way from being completed. I think this one will probably get some crystals to brighten it up. 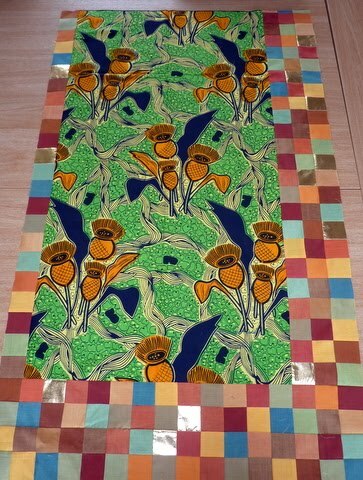 I managed to find a couple of hours to make a wonky triangle bottom border for the African fabric thistle coloured panel. 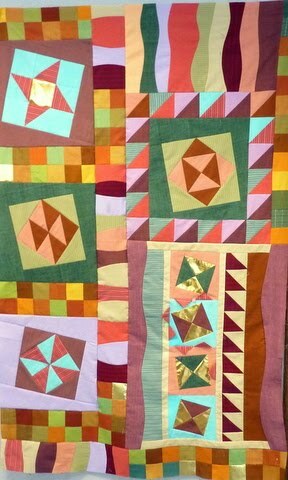 I will quilt it in chevrons then add some circles to the sides later. There is only one worryingly short week left until the school holidays. 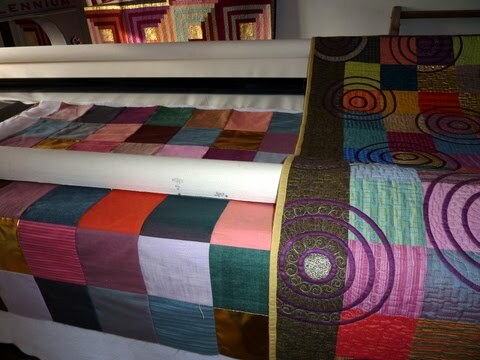 Apart from continuing to work on the Yurt while keeping the children busy and fed, I have several pieces still very much under construction for Festival of Quilts. I hope it rains all week so I can spend all of my time quilting. I admitted that my sore throat was not getting any better and finally phoned the surgery but predictably, it proved impossible to speak to a doctor. Mo was able to provide me with a second-hand set of unfinished antibiotics which I took for a couple of days that seemed to ease the symptoms. I came across an interesting recipe for an onion and chilli gargle which I may try as a kill or cure remedy. I accompanied Fergus’ class on another school trip at the local trout fishery and we all had fly-casting lessons. It was a beautiful day and we saw plenty of fish but they were obviously far too wise to be caught by noisy school children. Later that afternoon Tania I collected a bag of wild elderflower heads which had been in full sun so we hoped that they would help us to make a batch of perfect “champagne”. We wondered if the liquid would look too brown since we chose to use unrefined sugar. Several days later I was amazed to find that it was actually fizzing in the bucket so we will bottle it and hope for the best. Despite making several more batches of bread and some delicious brown bread ice-cream, which tastes far nicer than you would expect from its humble ingredients, I eventually got going in the workshop and completed the quilting on Celtic Circles2. I decided to keep it very close to the original version but there seem to be even more circles to paint this time. On Friday I drove down to Stirling for the biannual QGBI Region 16 residential weekend at Stirling University. I felt a little guilty at taking time off to have fun when I have so much else to do but it is such a great weekend that I soon relaxed and began to enjoy myself. 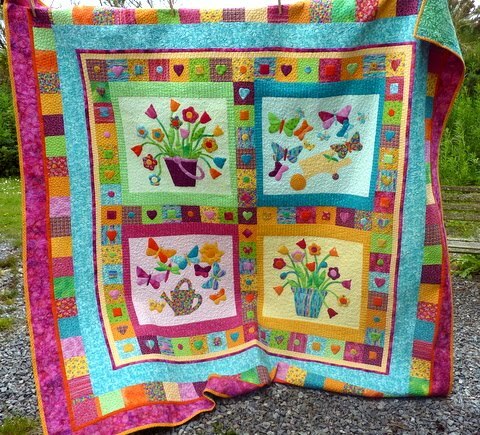 It is lovely to be catered for and spend the whole weekend sewing and catching up with quilting friends. 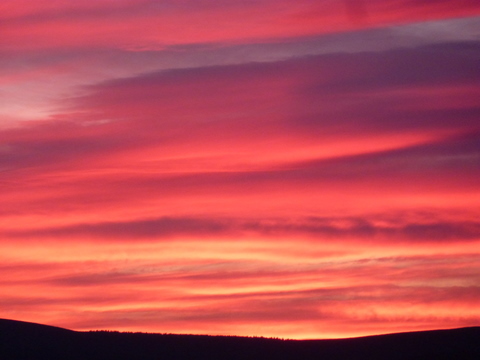 Everyone is friendly and visitors from outside our Scottish region are made especially welcome. My tutor was Katherine Guerrier and all of the students were delighted with the work that she inspired us to create. The piecing techniques were not as complicated as they seemed but the results looked impressive. We tackled curved piecing fearlessly without any special equipment or fiddly instructions as Katherine’s demonstrations were so well explained. I worked as fast as I possibly could and pieced an entire yurt panel using up scraps. It is a wackily random piece but by the time it has been quilted with circles it will fit in perfectly with all of the others. 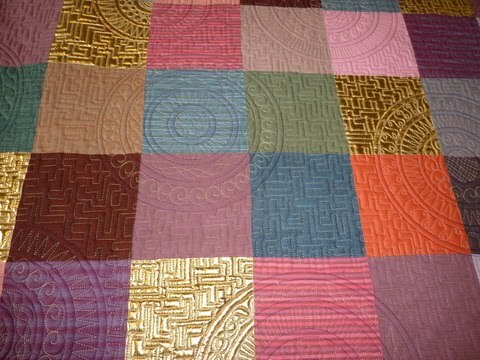 Many people made favourable comments about the Quilted Yurt and asked what I would be working on next. I have had a few interesting ideas ticking over for a while. However, I seem to have agreed to have a go at creating a suit of horse armour for the Loch Lomond Quilt Show in 2012…! It was a good thing that I got on with several projects early on in the week to make up for some “lost” time later on. 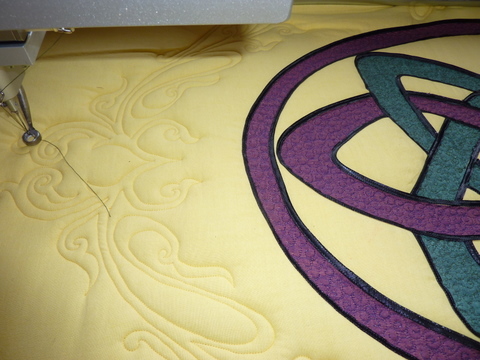 The trapunto on the Celtic Knotwork2 panel is coming along nicely. I quilted and dyed some more Yurt2 roof material and I added an assortment of Oakshott squares to make a wacky piece of African thistle fabric large enough for a Yurt panel. This is the first time that I have deliberately used an obviously printed fabric for a yurt panel but the thistle design is perfect. The squares were joined as “in-betweeners” while I pieced Celtic Circles2 so it seemed like I was piecing two quilts at once. I had hoped to get it all done and photographed but I was hit by a nasty sore throat which I suspect may have been tonsillitis so I had a couple of go-slow days. This coincided with a visit from my parents who have been on a tour of Scotland in their caravan, so actually the timing worked out rather well for a lazy and sociable few days. I was disappointed with my pumpernickel bread that took two days to assemble and then got badly stuck to the cast iron pan that it was baked in. I broke a knife and a spatula trying to extract the bread from the pan and have made an amendment to the recipe book stating that it must be baked in a tined lined with baking paper and protected with layers of brown parcel paper like a Christmas cake. Once I sawed off the blackened, crispy crust, the inside was actually pretty good. At least the dogs enjoyed it. After harassing the garage every day for seeming to take forever to diagnose the extent of the Landy’s electrical problems and get in the new parts, I finally got it back at the weekend. I breathed a sigh of relief as it started up beautifully. The garage has not yet presented me with the bill so I had better get stuck into the next customer quilt with gusto this week in case it is bad news! My week got off to a great start as I multi-tasked baking flapjacks, bagels and a loaf on Monday flying between dyeing and quilting yurt roof panels on Milli and the Celtic Drunkard’s Path on Lenni! I had grand plans to plough through a mammoth to do list in the following days after fitting in a school trip and a shopping trip to Aberdeen. I helped transport Fergus’s class on a visit with the Ghillie for a demonstration of fly-fishing for salmon. It was a beautiful day on Royal Deeside – the children really enjoyed paddling in the shallows looking for small fry and thought it was hilarious when an eel bit one of the class. Wednesday morning also started off according to plan. I posted LSD off to Australia for an exorbitant fee, made more bread and read a patchwork magazine before heading off to have coffee at Mo’s. My neighbour asked if I could help to start her car which had a flat battery. I had a niggling feeling that I didn’t really want to attempt it as the Landy’s battery is tucked away under the passenger seat but we always try to help each other out so we unravelled the jump leads to do some vehicular CPR. A short circuit happened somewhere and an alarming spark frazzled out from my car’s battery. When I tried to restart my car it was dead. I called the AA but could not actually explain the whole story because I don’t suppose that sort of casualty is covered. The mechanic tried to tell me that I had probably run out of fuel but I insisted that “in my opinion it seemed to be an electrical fault”… He had to call for a larger truck to tow the forlorn Landy to the garage, which by this time, had closed for the day. Just like the parent of a child with an unknown illness, I searched the Internet to track down a diagnosis and then worried about the possible symptoms even more. The next day was gloriously hot and two mechanics were “off sick” (obviously skiving) so it was nearly 5pm by the time the garage phoned to say that it was mended. I asked Mo to drop me off in Banchory on Friday morning to collect the Landy. However, there seemed to have been a miscommunication since the Landy was still dead and no-one seemed to know who had actually looked at it. I started walking home dejectedly knowing that Mo never takes her mobile phone with her but luckily she had a sixth sense that I would need a lift home and she spotted me on her way to Tesco. I was very annoyed with myself for thinking that I could tackle any job but instead I caused unknown damage to my own car which could yet prove to have been a costly mistake. I have made a pledge not to attempt any more rescuing, towing or botched mechanics in future. To make myself feel better I made doughnuts and as a punishment I refolded every single piece of fabric in my workshop. Actually, it was very therapeutic to sort through the stash and the neat drawers look most satisfying.